PlayStation VR v Samsung Gear VR: Is mobile or console VR best for you? Low cost, high end virtual reality is finally at your fingertips, meaning the biggest problem you have now is deciding which one to get. If the prices for Oculus Riftand HTC Vive are too daunting, then the mid-range cost of Sony's PlayStation VR may be up your alley. The set-up is simple and doesn't require a huge amount of living room space, and the quality is pretty close to Rift and Vive. Then you have even cheaper VR in the form of mobile headsets. Samsung Gear VR was an early contender with the Innovator Editions that not only proved virtual reality could be portable, but also widely accessible and affordable. 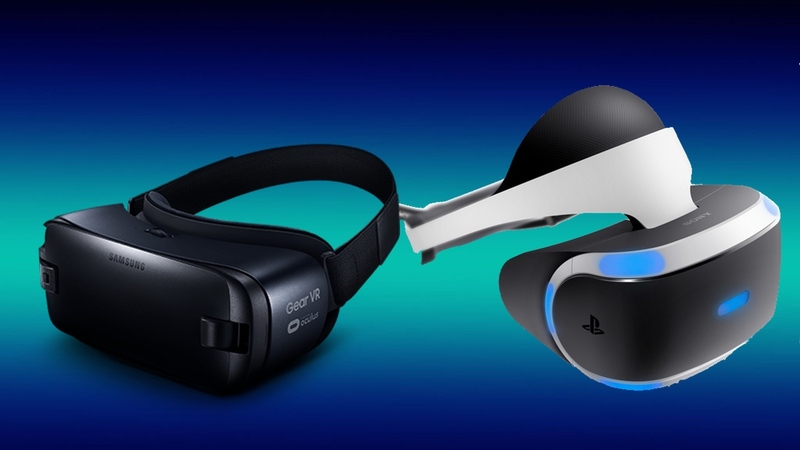 So which will it be: console virtual reality with PlayStation VR or mobile with Gear VR? Read on to see which one's a better fit for you. PlayStation VR looks like a weird futuristic helmet (in a good way), but still stands out from the likes of HTC Vive and Oculus Rift. With its blue lights (these act as head tracking points), the padded crown section for your forehead and the black and white finish, this is one stylish piece of tech. There's one wire that runs from the back but it generally doesn't get in the way since you aren't moving around too much. It doesn't add any extra weight to the already light headset either. Speaking of, at 610g, PS VR doesn't feel like it's going to slip down your face or bother your nose like other high-end headsets can. That's even after an hour or so of playing. There's no pass-through camera to see what's going on in the real world but there is a super handy button on the bottom of the headset that slides the screen back and forth to help you get a secure fit. It's also useful for peeking into reality without taking the whole thing off, should you need to pick something up. It's great for glasses wearers too as they can comfortably slide the headset around to find the perfect fit. Gear VR is much lighter than PS VR, which isn't a surprise considering it's a mobile VR headset. Obviously you'll add on some extra grams when the phone is slotted in, but regardless, it's still not very heavy. There's a little more heft compared to previous Gears though, since it's a little bigger to accommodate the larger Samsung devices. There aren't any wires at all, which means it's much more portable than the PS VR, however you're relying heavily on your Samsung phone for everything where PS VR is hooked up to a PS4. Comfort-wise, Gear VR has plenty of cushion and there's a diopter on top for glasses wearers. However, there's also much more room in the latest model if you want to leave the specs on. PlayStation VR is designed well for couch VR sessions but Gear VR allows a bit more freedom. Either way, both are comfortable to use. PlayStation VR features a 5.7-inch, 1920 x 1080, OLED display split vertically to deliver a resolution of 960 x 1080 to each eye. In order to reduce eye strain, the screen needs to operate at high refresh rates: PlayStation VR tops the PC VR machines with a 120Hz refresh rate. However, all this can still make for a dizzying experience, which we've noticed with certain games. There's also a slight screen door effect in game menus and so forth, but fortunately it doesn't always translate to actual gameplay screens. There's a 100 degree field of view which is slightly smaller than Rift and Vive, and even some mobile VR headsets – like the Gear VR. While the display is wholly dependent on whatever Samsung phone you have, the field of view is 101 degrees, which is an upgrade from the previous Gear VR's and again, one degree better than PS VR. Despite the larger FOV, it's a pretty minor difference if you think about the display quality you get with PS VR. There's no controller in the box for Gear VR but there are plenty of third party options to choose from. However that means adding on $20-50 more for an additional accessory. Then there's the trackpad on the side of the headset, which you can use for mini-games and navigation. You're probably better off using a Bluetooth controller for more complicated mobile games. PlayStation VR requires the Move controllers – usually two – for its games. You'll also need the PlayStation Camera for tracking. Unless you already have these peripherals, you can pick up a bundle of all the necessary parts. If motion tracking is important to you, then PS VR is the clear winner. In Gear VR's early days it was slim pickings on games, but it has now had a head start on Sony to fully develop a store filled with tons of content. There are new games, short films, apps and general VR experiences released weekly for Gear. For the most part they're affordable, and many titles are free. PlayStation VR is expected to fill up its store with 50 games by the end of the year and it's slowly but surely living up to that promise. Where you'll primarily find mini-games and mobile games on Gear, PS VR offers triple-A quality and longer games. So for seasoned gamers, the PS VR makes the most sense. However if you aren't really sure about VR just yet, the experiences on Gear VR will do just fine – especially since you're bound to find something suited to your tastes. There's a pretty large disparity when it comes to price for obvious reasons. PlayStation VR is $399 but offers the 'console VR' experience. Meaning it's cheaper than PC VR but costs more than mobile VR. Gear VR is priced at $99 for the everyman which makes sense as it's a useful introductory device for VR newbies. Of course, you'll also need a compatible Samsung smartphone to use it – which may be a cost to consider too. It's also good to keep in mind that both devices continue to rack up dollars if you add in the various accessories needed to enhance the virtual reality sessions. If you want the more immersive experience, then PlayStation VR is the headset for you. Typically, a bundled set with controllers – and even the PS4 console – will still be cheaper than PC VR. You don't get full room-scale, where you can walk around in VR, but it still offers motion tracking so you really feel like you're in virtual reality. Samsung Gear VR is more family friendly and accessible – to a point. Remember, you'll need a compatible Samsung handset to use the headset. While it's the cheaper and more portable option of the two, you may be better off with Sony's device. And if you really want to have mobile VR on hand, Android owners can check out the cheaper, slightly more compatible Google Daydream View headset.